Checking accounts come in all shapes and sizes to fit every consumer’s needs – fine, not every consumer. While options can be good when you’re shopping around for a new bank, they also lead to a plethora of fees and risks for consumers. While some practices have improved, a new Pew Charitable Trusts report shows banks have a long way to go and it’s time the Consumer Financial Protection Bureau took action. The new report [PDF], “Checks and Balances: 2014 Update,” analyzes the practices at 44 of the 50 largest banks in the United States. Banks are evaluated for their “best” and “good” practices across three categories: disclosure, overdraft, and dispute resolution. Pew defines best practices as those that are the most effective in: providing checking accountholders with clear and concise disclosures about costs and terms; reducing the incidence of overdrafts and eliminating practices that maximize overdraft fees; and offering consumers a meaningful choice to resolve a problem with their bank rather than including mandatory binding arbitration clauses in checking account agreements. The report found no bank achieved best or good practices across the three categories, despite significant improvements by some. Many of the banks evaluated in the report have made important progress when it comes to disclosure practices since last year’s study. Nearly 43% of the banks studied have adopted a summary disclosure box of terms and fees that meet all of Pew’s criteria, up from just 22% in 2013. Of the banks and credit unions that use disclosure boxes, 26 worked with Pew to adopt a model disclosure box as of January 2014, including nine of the 12 largest banks and the three largest credit unions in the U.S. 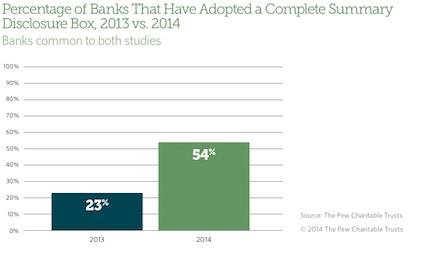 In all, 28 banks make disclosure boxes available to consumers, 19 of which meet Pew criteria. Additionally, Pew found that more banks make their account agreement and fee schedules available online than in 2013. Only 12 banks did not do so this year. In 2012, U.S. consumers paid $32 billion in overdraft penalties. Research has shown that such fees can push consumers out of the banking system, Pew reports. 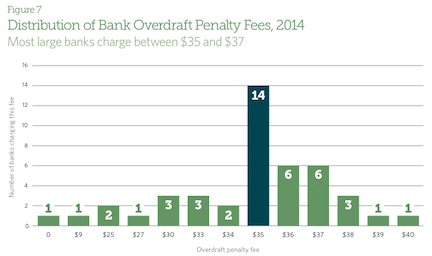 In the past, overdraft fees ranged from $30 to $40, with a median charge of $35. However, the size of the fee has become more uniform, with most of the banks charging between $35 and $37, with the median remaining at $35. Today’s study found that detrimental overdraft practices remain in operation at many of the banks surveyed. However, certain areas such as the threshold amount before an overdraft fee is charged and limits on the number of overdraft fees a consumer can incur in one day have improved. Only seven of the 44 banks surveyed recorded best practices for at least three of Pew’s seven criteria categories: no ATM overdrafts, no debit point-of-sale overdrafts, no high-to-low transaction reordering, limited high-to-low transaction reordering, threshold month to trigger an overdraft, no extended overdraft fee and limited number of overdraft fees per day. Two figures relating to overdraft fees remained mostly unchanged from the 2013 study. Only 10 banks report they would deny ATM withdrawals that would overdraw a checking account, an increase of three banks from the previous report. Nine banks continued to decline point-of-sale debit overdrafts or do not charge a fee for over drafting an account to ensure customers will not be charged for generating a negative balance with the transactions. Pew found that some banks continue the hazardous practice of processing transactions from largest to smallest, an act that can maximize the number of overdrafts charged. Of the banks surveyed only 22 did not engage in the practice. Banks have employed additional policies that can help limit the impact of overdraft fees, including reordering only certain types of transactions, implementing a threshold amount to trigger an overdraft, and not charging an extended overdraft fee. The Consumer Financial Protection Bureau reports that larger banks tend to include the clauses in their agreements, while midsize and smaller banks do not. The Pew report echoed that finding saying that the larger the financial institution the more likely an account agreement contains a clause requiring mandatory binding arbitration. 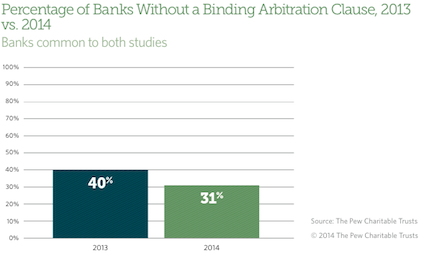 Only 31% of all banks surveyed do not include mandatory binding arbitration agreements in their checking contracts. However, eight of the banks analyzed did make the cut for Pew’s best practices of offering arbitration opt-out provisions, not require a jury waiver, and including a small claims exemption. While Pew maintains that many bank practices have improved since last year’s analysis, there is still need for action from the CFPB to ensure banks offer the highest levee of consumer protection. 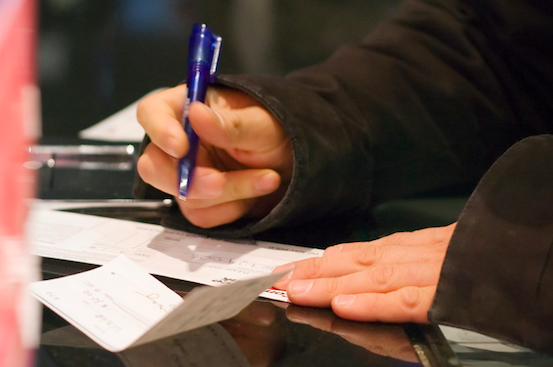 Prohibit predispute mandatory binding arbitration clauses in checking account agreements, which prevent accountholders from accessing courts to challenge unfair and deceptive practices or other legal violations.